Recently Ana joined the Long Painting Company team! 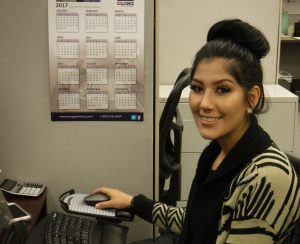 She brings over 5 years’ experience as a receptionist, is bilingual, and a team player. Ana enjoys helping people anyway she can. Her passion is to pursue the beauty industry. While attending Cascades Job Corps College and Career Academy, in Sedro Woolley, she acquired her Business Technology Certificate. Shortly after she graduated, she decided to move to Kent. Her free time is spent with Bella, her 1 year old daughter who keeps her very busy. Ana also loves spending time with her family. Stop by the front desk to welcome her!